Delivery time: When purchasing the card through our website, the delivery time is up 10 days. 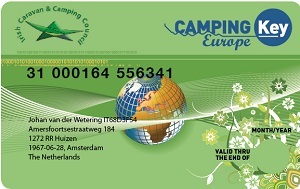 Europe's most complete Camping Card is Camping Key Europe (CKE). Camping Key Europe (CKE) is a new benefits/identity card and is recognised in camping sites and holiday parks across Europe. The CKE card can be used in 20 European countries and over 2,500 camping sites. The CKE card entitles you to lots of great discounts and offers at attractions, visitor centre's, campsites, ferries, etc. throughout Ireland. Camping Key Europe offers you liability insurance if you are not otherwise insured. The insurance covers damage and accidents for the card holder and his family (and up to 3 children under the age of 18). Full details can be found here. The Card is valid for this calendar year mentioned on the validity sticker. The Camping Key Europe is valid in all European countries and obligatory in the Scandinavian countries. The Card must be signed in order to be valid. The card is valid for one calender year and will have a year label attached. If you have a card from a previous year, you will need to buy a new card online. of a minimum of 5 and a maximum of 11 people (school classes, scouts, etc) travelling together. The group leader must be over 18.
by the cardholders personal liability insurance or where no insurance is held.